The Riu Montego Bay inclusive resort is a great vacation spot for families, couples or friends in Jamaica's second major city. Many people have great things to say about this bundle of joy (some feel differently) and this Montego Bay hot spot welcomes tourists from all over the world all year round. What's The Weather Like In Montego Bay, Jamaica? Like most places in the Caribbean in general and in Jamaica in particular, the weather in Montego Bay is great all year round. Consequently, visitors frequent the area at anytime during the year. There is no bad time to visit Montego Bay. During the hottest months of July and August, the highest temperatures remain in the 90's. And during the "coldest" months of January through March, the highest temperatures remain above 80 degrees. It helps to know what others have experienced at a desired resort. Stories of great times push us to want to go, while stories of unpleasant experiences cause us to think twice about visiting a particular place. Find the best deal, compare prices, and read what other travelers have to say about Riu Montego Bay Hotel. The Donald Sangster's International Airport in Montego Bay is the nearest airport to Montego Bay. This is the airport most travelers to Jamaica choose when visiting Montego Bay, Jamaica and most Jamaican tourist hot spots. 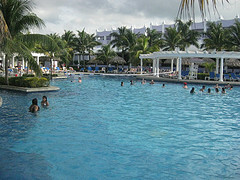 The Riu Montego Bay is just about two (2) miles from the airport. Generally, if you book an inclusive package (flight and resort), arrangements will be made to transfer you and your family from the airport to the Riu Montego Bay inclusive resort. In some cases, simply booking the resort only may also come with complimentary transfers. Otherwise, you will need to arrange for transfer. 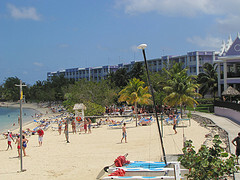 There are several companies which offer transfers from the Montego Bay airport to Montego Bay hotels. While it is safer to use the airport's shuttle/taxi service, it will be less costly to use another service. Visit the Transportation Hall at the airport to find a shuttle service. 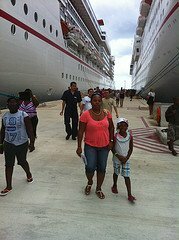 Some past guests recommend Reggae Tours. You may reserve their service online, or wait until you get off the airplane. 1. Hilton Rose Hall Resort & Spa: Find the best deal, compare prices, and read what other travelers have to say. 2. Secrets Wild Orchid Montego Bay: Find the best deal, compare prices, and read what other travelers have to say. 3. 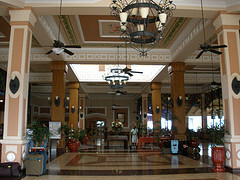 Iberostar Grand Rose Hall: Find the best deal, compare prices, and read what other travelers have to say. 4. 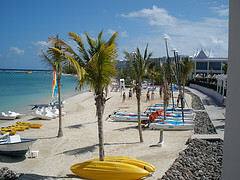 Sunset Beach Resort, Spa & Water Park: Find the best deal, compare prices, and read what other travelers have to say. Didn't find what you were looking for? Use the Search Box below to continue your search for other inclusive resorts. I believe that you and your family will have lots of fun. When you get back please share with us your experience at the Riu Montego Bay inclusive resort.